We drove on along the coast through towns and villages way off the tourist track. It was very interesting to see what Bali must have looked like before the advent of tourism. There did not seem to be as much evidence of offerings and ceremony as in the rest of Bali, where they are literally everywhere. There also was much more evidence of Moslem influence in the north coast communities - in fact we had noticed this since Candi Kuning, where the amplified call to prayer of an Islamic mullah from a nearby mosque had rung out over the peaceful waters as we were visiting the temple. The local Hindus say they worry sometimes about the influence of Islam over the predominantly Hindu Bali, as Moslems are in the majority in the Indonesian government and in the rest of Indonesia - but on the whole they seem to get along well. Finally we reached a beach where we could rent some snorkeling gear and a boat to take us over to Menjangan Island, just off the coast. About $40 (which seemed a lot by Balinese standards) covered the entrance fee to the park, the snorkeling gear, the boat fee over to the island, and "insurance". 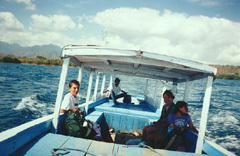 Menjangan Island, which means "Deer Island" is part of the West Bali National Park. To our surprise we had the whole boat to ourselves. It took about 45 minutes to reach the island. It was a beautiful ride - azure seas and palm-fringed beaches, the mountains of Bali rising in the background. When we got to the island there were about 5 boats there already - but it wasn't by any means crowded, and we had the beach virtually to ourselves. We could snorkel from the beach right next to the jetty. This is a Bullet-head Parrotfish. Click on the images for a larger view. We had been lucky enough to time our arrival with high tide. As the tide slowly went out, getting across the shallow coral extension of the beach became more difficult. 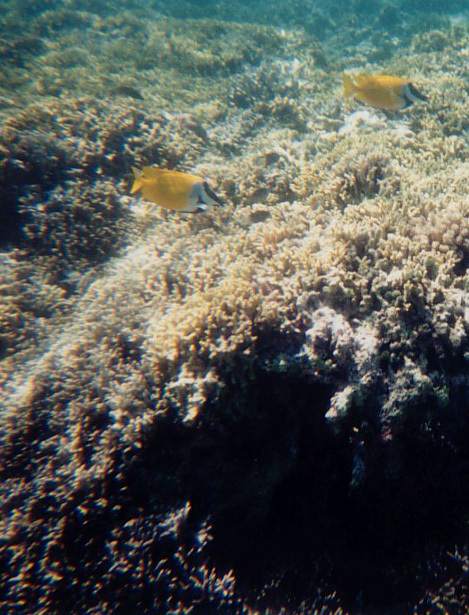 This is a school of Sergeant-Major Damselfish and a pair of yellow and black Moorish Idols. 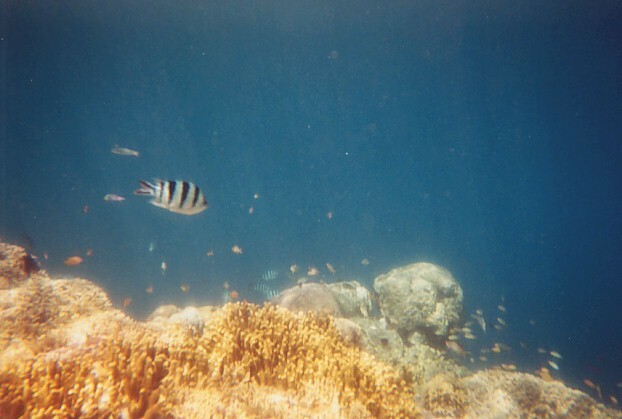 But even though we are by no means expert snorkelers, we had some amazing views of the fish and coral there. The water was very clear. 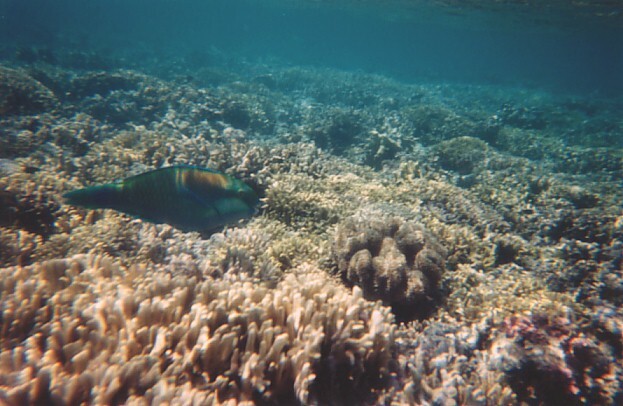 Once you got past the 20 feet or so of shallow coral, really beautiful areas of coral opened up. These are Pencil-streaked Rabbitfish. Fish of every color swam around us. These pictures were taken with a simple waterproof disposable camera - not professional equipment by any stretch of the imagination. This is a Blue Linckia Seastar. The children had never seen anything like it. They were enthralled. This is a Dusky Angelfish. 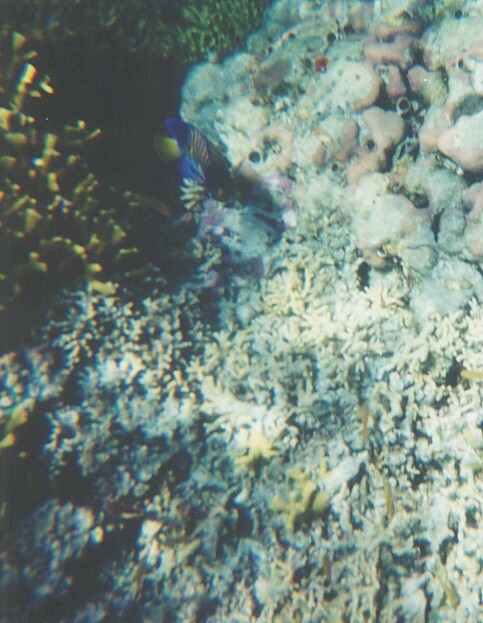 Past this stretch of coral, the ocean floor drops away into deeper water. This was where the most interesting fish swam. We felt we were flying over a strange, psychedelic landscape. 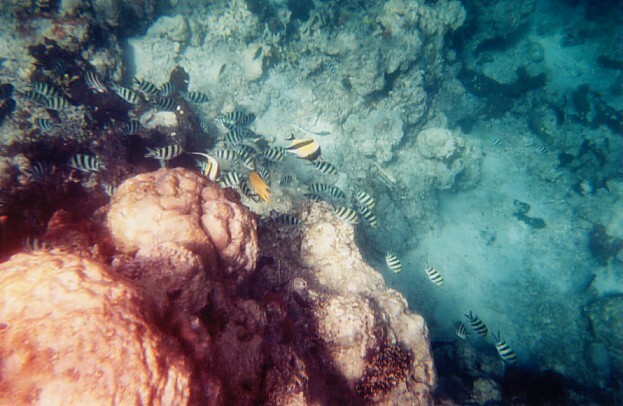 These are Damselfish of many different varieties - the Sergeant-Major, Pink Anemone fish, Violet Demoiselles, Green Chromis, and many other kinds. We felt as though we were swimming through a Jacques Cousteau documentary - a fabulous undersea world of amazing coral and fish. 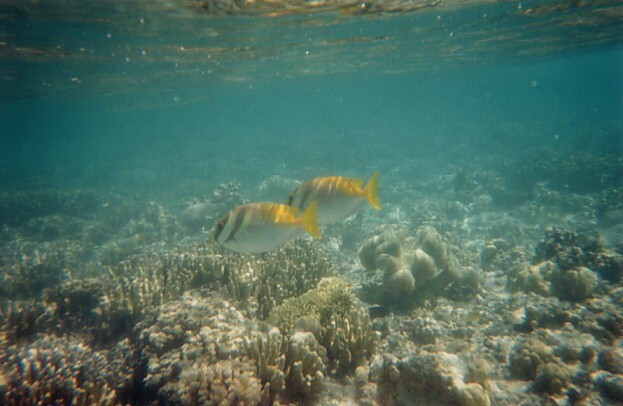 These are Foxface Rabbitfish. 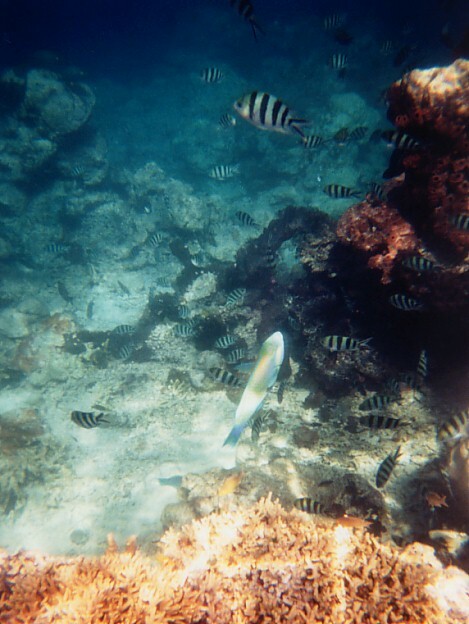 These are the Sergeant-Major Damsels and the Parrotfish again. We swam past many other shoals of tiny fish, brightly-colored Yellow Tang, Angelfish, Stars and Stripes Puffers, Fiji Devils, and strange long Pipefish with sea-horse heads. 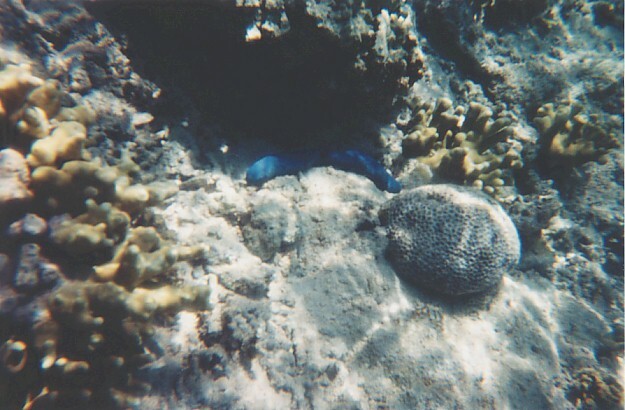 We spent most of the day on the beach and swimming around the coral, before taking the boat back to the shore. Dewa was waiting for us, and we took the long drive back to Ubud, via the western extent of Bali and back along the south coast road, busy with trucks and buses on the main route between Java and Bali's capital city of Denpasar. Maniac bus drivers off the boat from Java overtook us in the most insane places.